Dutch contribution to the Crystallography Open Database at risk? The Dutch company PANalytical has made their HighScore software available (some details in this README) for use in the Crystallography Open Database. ICDD is rumored not to be amused by the contribution of the HighScore-based search functionality, and rumored to be claiming breach of intellectual property. I have not seen either any ICDD patents nor the HighScore implementation, but clearly there is a conflict of interest. BTW, Panton Principle endorsers may be interesting in signing the petition for Open Data in crystallograph too. This weekend there was the really nice Science Commons Symposium, which I virtually attended, and there is an interesting discussion at FriendFeed on article level metrics. Now, I just reported on the CDK functionality used in published research. Linking this to impact, the CDK with 115 citations now (both papers, nice increase from 2006) is not doing bad. 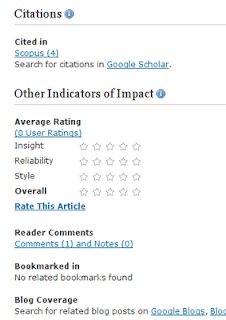 But the real impact goes further than the direct citations. 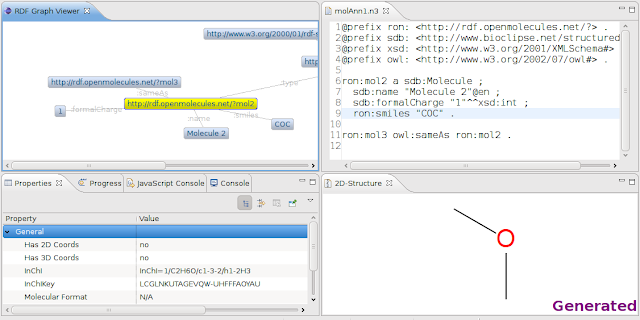 The BRENDA enzyme database is one of the project where CDK functionality is (was?) used, and the matching papers (doi:10.1093/nar/gkh081 and pmid:11752250) have been cited 241 times. Surely, BRENDA does very much more than just the used CDK functionality. Clearly, NMR is now less important, though it is indeed overall one of the more important use cases of the CDK. Chemical and molecular are important terms, and considering the molecule is the primary use case of the CDK right now. I think these are very workable next steps in Open Date, perhaps even worthy end goals. I endorse them. This is in my opinion the most important principle. Too often you find a database with really useful data, but without any clue about what you are allowed to do with this data. Of course, I can contact the authors, get their permission, etc. They probably like it that way, and I can even understand that. However, it does not scale, and it is slow. Even worse is the situation when the original composer gets missing in action. Both are equally valid, but explicit statements just make things easier. This principle is debatable. Very much like the BSD-vs-GPL flamewars, some like copylefting, others do not. There is an important difference though. Software has the concept of interfaces, allowing to more easily share incompatible licenses cleanly separated by these interfaces. This, for example, allows you to run proprietary software on a Linux kernel. However, data sets do not have such a concept. There is not such thing as an interface between two numbers. This makes the concept of mixing data sets different: because there is no such interface, any mixing can only happen between compatible licenses. This is one reason behind the choice of very liberal licenses like CC0. This license, or waiver really, allows you to do anything, and most certainly, mix data sets. And that makes things a lot easier. But then again, while these are nobel goals, I rather see people use a copylefting licenses than no license at all. I think again making things easier is the goal. The non-commercial clause is interesting, and actually likely an important one. Consider course material, a course book. Those are commercial. Some even argued that many universities themselves are actually commercial entities. I second these choices over a mere claim claim that the data is public domain. The PD concept has many meanings and not the same in every jurisdiction. In particular, differences between USA and EU law. Waiving these right, which is just the same as claiming public domain, works in any jurisdiction, again, making things a lot easier. The underlying pattern of my comments must be clear: the principles make life easier. This is all what Open Source and Open Standards (whatever those are). The three pillars of the ODOSOS mantra is not goals, but merely the means of making life easier. The Panton Principles certainly make life easier in Open Data, and initiative like the Linking Open Drug Data in which I participate will greatly benefit from people adopting them. The Principles do not solve all problems. There is still a lot of 'Open Data' licensed with unrecommended licenses. 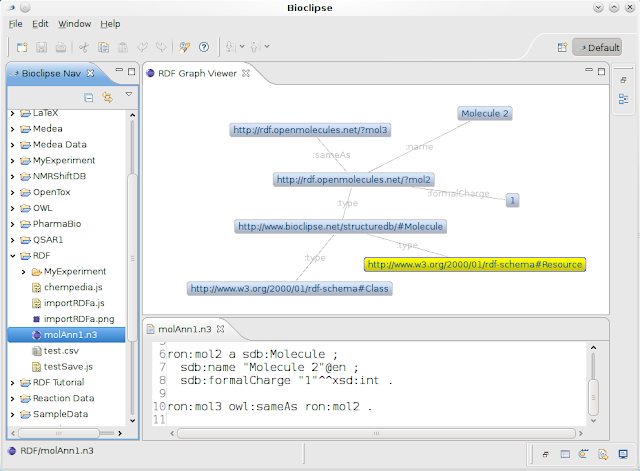 For example, the NMRShiftDB uses a GNU FDL license, and data from supplementary material of Open Access journal articles is like Creative Commons. 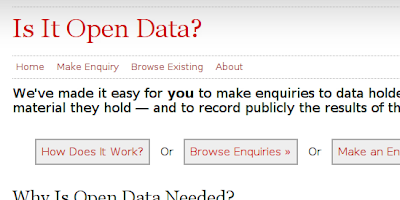 Another related initiative should certainly not go unnoticed either: Is it Open Data? is a service where you can try to resolve what the license is for one of those databases which is not quite Panton Principles compatible yet. Anyone knows how we can convert this into some nice world map graphics with a few lines of code? Two weeks ago, a paper by Peter Ertl was published about Molecular structure input on the web (doi:10.1186/1758-2946-2-1). In this paper, he discusses the state of things and describes his contribution to this field, the JME Molecule Editor. The article also cites the CDK, but only the website and not one of the two papers (doi:10.1021/ci025584y, or doi:10.2174/138161206777585274). This is not an isolated case, but a common pattern. In principle, the proper work is cited, and nothing is wrong. Practically it means, that a citation to the CDK website does not show up in the citation network. This is not a problem caused by these papers, but merely by the nature current citation databases work: they only count citations between journal articles, and only sometimes extend to books or conference abstracts. Now, addressing the limitations of the current citation databases is technically simple, and purely blocked by social and commercial aspects. The Citation Typing Ontology by David Shotton defines the framework to define citation types, independent from any existing database. The semantic web technologies will take it from there, and allow aggregation etc. There are some things to think about on how to use such citation networks, though. If we calculate the impact of the CDK project, we should combine citation counts to the website(s), papers, etc, after removal of duplicates, etc. The cito:cites does link to resources, and the CDK paper resources is not the same as the CDK website resource. But, we could define a Project Class, where both are foo:partOf. Then, we could define that the triple chain the:citingWork cito:cites the:CDKArticle foo:partOf the:CDKProject would imply the triple the:citingWork cito:cites the:CDKProject. Now, while writing up this blog, I realize that my fork of this morning, A BIBO Citation Typing Ontology, might actually be counter-productive in the long run, as I was only working out a solution to a simpler, but different problem, which the CiTO also addresses: a citation is not typed. When a paper does cite the CDK paper, we still do not know if it uses the CDK, or merely mentioned it as related-but-unused, or even refuted work. 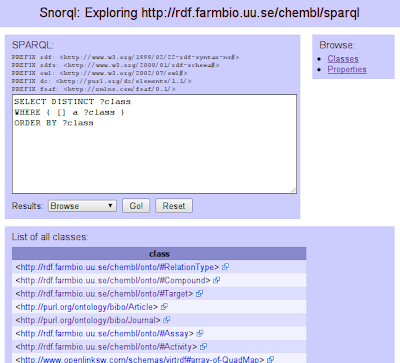 Now, as I am leaning towards the Biobliography Ontology as RDF-based system for my references, and been using this already in the RDF store hosting the ChEMBL data, I forked the CiTO to define rdfs:domain and rdfs:range on bibo:Document. The CiTO 1.5 actually defines a large set of document types too, and I rather see BIBO reused. This indeed has the downside that the bibocto:cites cannot be used for the above chaining, and this might bite me seriously later. Well, nothing wrong with a failing experiment, right? For now, it will serve my purpose: setting up a citation database for the CDK project papers. I am not entirely happy about the error-prone XHTML+RDFa of the above example, and filed a question of better solution on SemanticOverflow. 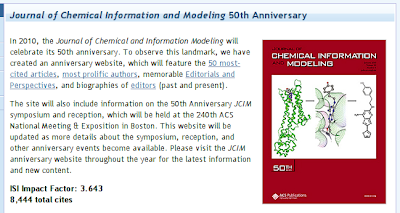 It is also gratifying to see the advent of open source movement in cheminformatics on the Internet, as advocated for example by the Blue Obelisk Group (40) and witnessed by collaborative projects like Chemistry Development Kit CDK (41), Jmol (42), Bioclipse (43) and several others. which is very much appreciated! JChemPaint in OpenOffice.org! Cheers to Konstantin! Quite a while a go, I blogged about Zest in Bioclipse showing a bit of ONS Solubility data. I could not follow up on that until now, as I had yet to do a lot of RDF work in Bioclipse, so the screenshot back then was kind of a mockup. Most of use know that 4:24 for two visitors is not necessarily significantly different from 2:43 for one hundred visitors (actual numbers). Standard deviation information would have helped significantly here (pun intended :). to understand the paper, by looking up cited references and methods. to force you to actually formulate them. will attend. Meetings are from 10-11 am. With the obligatory note that the number of commits does not reflect the amount of work involved. Congratulations to all current and past editors of the journal, and also all reviewers who helped the journal publish a lot of really good papers! I have been very happy to have been reviewing papers for the journal. It's also very nice to see two friends from the next generation show up on the list of prolific authors: Andreas and Rajarshi. Of the older generation, I also notice Henry in that list. Congratulations to them too!